Canine Influenza, both H3N8 and H3N2, are transmitted by airborne particles, as well as direct contact. Every at-risk dog needs to be vaccinated. Canine Influenza (CI), also known as dog flu, has been in the United States for years. It was first documented in 2004 during an outbreak at a greyhound racing track in Florida. Click here to read about the disease. Click here to read about the vaccine against the disease. There is, however, a new wrinkle in CI. A strain of the disease that has been known in China, Korea, Japan, Thailand and other Asian nations since 2007 is responsible for the outbreak that hit thousands of dogs in and around Chicago, IL. Today, we will look at what is known, what is unknown and what is on the horizon. Most importantly, neither this canine influenza virus (CIV), H3N2, nor the previously-known strain in the US, H3N8, infects people. Both are influenza “A” viruses. We know that some strains of human flu also infect pets and farm animals, most notably swine flu, H1N1. In addition, some seasonal influenza viruses of people are H3N2, but with genetic differences that prevent the human strain from infecting dogs, and vice-versa. As far as we know right now, H3N2 canine influenza doesn’t seem to be as virulent as H3N8. However, it is still very contagious, meaning it is extremely capable of infecting additional victims by both aerosol and direct contact routes. Like its older cousin, the “new” dog flu can become complicated by bacterial respiratory tract infection and can result in pneumonia. Fatality rates with H3N8 are about 8% of infected dogs. In the Chicago epidemic, H3N2 death rate has been considerably lower. An important factor to note in the Chicago outbreak is the difference between reported cases and actual cases. As of April 6, 2015, five dogs were documented to have died from CI. No one knows how many dogs passed away, yet the deaths went unreported because veterinarians were so busy with a heavy caseload. Likewise, not every ill dog was reported to authorities. Furthermore, not every dog with upper respiratory tract infection was tested for CIV and, surely, not every upper respiratory tract infection case was caused by CIV during that time period. Are dogs inoculated with H3N8 vaccine protected against H3N2? We don’t know. [At the time this article was written, there was discussion that H3N8 vaccine would protect dogs against both. We know now that it does not. An H3N2 vaccine is available. ]Since the first laboratory-confirmed case here on the Mississippi Gulf Coast in 2012, many South Mississippi veterinarians have been vaccinating dogs against H3N8. I have direct confirmation that researchers at Zoetis, formerly Pfizer Animal Health, are working to determine how much, if any, cross-immunity is provided against H3N2 by the H3N8 vaccine. They are also looking at whether future vaccines should be multivalent, containing antigens of both viruses to afford protection. The alternative would be a separate vaccine for each strain. Surely other animal health companies are also looking into these aspects, but I have not heard from them. For now, virologists say the H3N8 vaccine is the best we have and should be used for at-risk dogs when you and your veterinarian discuss his likelihood of becoming infected. “Lifestyle” factors affecting the decision on whether to vaccinate include association with other pets, such as meeting other dogs on your daily walk, and exposure to dogs of unknown disease status in dog parks and retail stores where pets are welcomed. Congregating with other dogs, such as boarding kennels, including your veterinarian’s boarding facility, is an activity that increases a dog’s risk of many respiratory infections, even if the boarders are not allowed direct contact. Remember, this is an airborne disease. Initial vaccination requires a series for protection. A first vaccine is administered by your pet’s doctor, with a booster 2-4 weeks later. 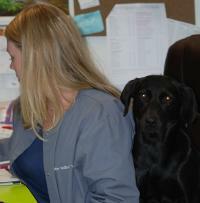 Subsequently, the vaccine is given annually with your dog’s other annual vaccinations. WHAT ABOUT MY CAT, AND OTHER PETS? H3N8 infects cats, but not readily. There is no vaccine against Canine Influenza for cats. One laboratory-confirmed case of H3N2 has surfaced in a cat in New York City. Other healthy domesticated animals appear to be resistant to infection by both viruses. Click here to read an update on Canine Influenza in cats. We know that H3N8 mutated from an equine (horse) influenza discovered over 40 years ago. H3N2 is believed to have mutated from an avian (bird) flu, and has existed for a shorter time period. H3N8 has been documented via laboratory confirmation in at least 39 states as of this writing. A case matching the Chicago strain appeared in Houston, TX. That dog travelled from Chicago, and could have infected other dogs in Texas, as well as along the route from Illinois to the Lone Star State. States surrounding Illinois have reported confirmed cases. Colorado has had H3N2 cases and California has had at least one confirmed.